Elaine Lan Chao (趙小蘭; born March 26, 1953) is an American politician. 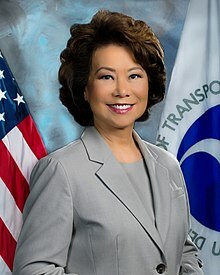 She is the 18th and current United States Secretary of Transportation, since January 31, 2017 during the Donald Trump administration. She served as the 24th United States Secretary of Labor under President George W. Bush from 2001 to 2009, and Deputy Secretary of Transportation under President George H. W. Bush. She was the first Asian-American woman and the first Chinese American in U.S. history to be appointed to a U.S. president's cabinet. Chao was born in Taipei, Taiwan. Her parents were Ruth Mulan Chu Chao (1930–2007) and James S. C. Chao (born 1927). Her parents immigrated to the United States in 1961. She studied at Mount Holyoke College in Massachusetts and at Harvard University. Chao was the only cabinet member in the George W. Bush administration to serve for the entirety of his eight years. She was also the longest-serving Secretary of Labor since Frances Perkins, who served from 1933 to 1945, under President Franklin D. Roosevelt. On November 29, 2016, it was announced that President-elect Donald Trump planned to nominate Chao for Secretary of Transportation when he takes office. On January 31, 2017, the United States Senate confirmed Chao's nomination with a 93-6 vote. She assumed office on the same day, with Vice President Mike Pence swearing her in. Chao is married to Senate Majority Leader Mitch McConnell of Kentucky. ↑ "Chao becomes fifth-longest-serving Secretary of Labor". Peace Corps Online. Retrieved December 21, 2007. ↑ "US Department of Labor History". Retrieved September 16, 2009. ↑ CNN, Phil Mattingly and David Wright. "Trump picks Elaine Chao for transportation secretary". CNN. Retrieved 2016-11-29. ↑ "US Senate Roll Call Vote PN35". United States Senate. January 31, 2017. Retrieved January 31, 2017. This page was last changed on 24 February 2019, at 20:27.